The reality is that there’s no such thing. 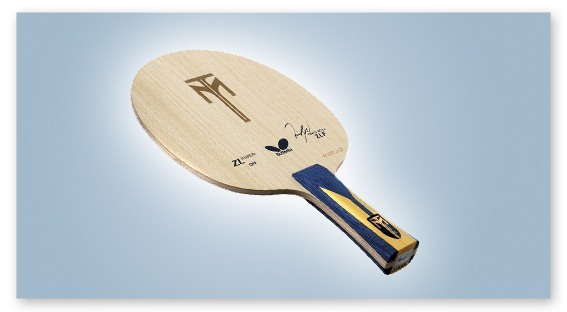 Timo Boll uses equipment that fits his style, and there’s even a chance that there’s equipment out there that’s better for him but he hasn’t realized it (though unlikely). For his strokes and his overall strategy, his equipment works. If you’re a new player that has just stepped out of the basement and started playing at a local club, should you get the same equipment as Timo? I doubt it. It’s all about what kind of racket suits your style right now. Given the strokes that you use, how offensive or defensive you are, and the variations of the strokes you use (eg. spinny loop vs. loop drive), you have to find what suits your overall game. But I’ll Grow Into It! While that’s true to some degree, I don’t think it’s the best strategy. When you use a racket that is too fast and uncontrollable for you at this time, you won’t have the confidence to use full power in your swings, slowing down your progress. If you’re practicing the loop stroke, and you keep hitting the ball off the table, you’ll probably reduce the power in your stroke in order to keep it on the table. If you’re confident in your stroke, and are able to swing at full power and still maintain good consistency, then it may be a good time to upgrade to something faster. And when you do, your proper full stroke will continue with your new blade. If you’re moving up from the basement, or even have a USATT rating of up to 1100, I’d stick with a medium-speed racket. If you have a professional coach and are being trained regularly, then you can afford a bigger leap in racket speed since the coach can give you immediate feedback and tips to adjust your stroke. Another thing to consider is your defensive game. When playing short balls like returning serves or pushes, are you popping the ball too high or deep often? A faster blade will only magnify the problem. So consider these points when you’re thinking of your next blade or a friend asks you the infamous question, what is the best?! I agree, people always buy the fastest racket they can find but it’s not good for them. This entry was posted on Sunday, November 8th, 2009 at 11:00 pm	and is filed under Equipment, Rant, Tips. You can follow any responses to this entry through the RSS 2.0 feed. You can leave a response, or trackback from your own site.